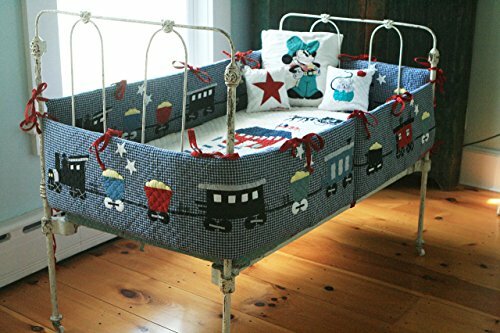 "Local Loco" Bumper - a Train Your Little Boy can Sleep with.- Navy-White- Red- Yellow -Black ... its' Engine, Its' Coaches, Its' Rail Cars ,its' payloads.. All the things the baby can see on his "local Loco"- It's Handmade ! Hand Appliqued, Hand Embroidered ! Its' Reversible! Its fun! Its washable ! Its our "Local Loco" ! Before Washing bumper, Please remove Insert.